By midway through the race, there were no challengers left for Cole Sprout and Easton Allred. 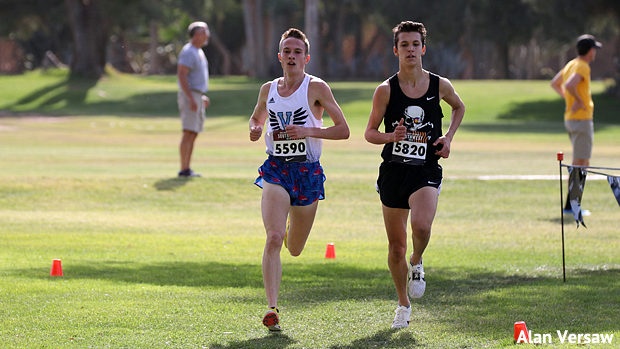 As it has been for several years on end, now the Nike Southwest regional was dominated today by teams from Colorado and Utah. The pendulum of power has swung more decisively in Colorado's direction this year, but Utah still makes a worthy adversary. Conditions for this year's races, while probably a bit warm for the tastes of many Colorado athletes who've become more acclimated of late to temps in the 30s and 40s, were as pleasant as they've been in years. Highs hit the 70s, but did not venture into the 80s. There was almost no wind throughout the entirety of the morning's races.